The Lesser Knob Coral can be extremely beautiful, having bright contrasting colors in aquacultured specimens! Aquacultured corals of the Cyphastrea genus are extremely beautiful, and the Lesser Knob Coral Cyphastrea decadia is no exception. The natural colors of this group include gray, brown, cream, green, yellow, and white. Aquacultured specimens have been developed into much more colorful animals! These varieties can include shades of reds and oranges, pinks, purples, blues, and lavenders. The colors often contrast, with the background or surface area, known as the 'coenosteum' being one color, while the 'corallites', the raised areas where the polyps reside, being another. Aquacultured specimens are nothing short of amazing! The Cyphastrea genus is well defined. The corallites all have separate walls within the colony and the very center of the corallite, the calices, are less than 3 mm in diameter. The tissue in between the corallites, the coenosteum, has a grainy surface. Cyphastrea corals can resemble Enchinopora species and Plesiastrea versipora. However these other corals have larger corallites, can often have costae contact between the corallites, and the coenosteum is generally smooth rather than grainy. The Lesser Knob Coral C. decadia is a unique member of the Cyphastrea genus because it forms into a branching coral. Cyphastrea corals usually occur as massive encrusting colonies in the wild, with very few having a branching form. However the Lesser Know Coral has a growth form with both axial and radial branches. Thus, it is also known as the Branching Coral. 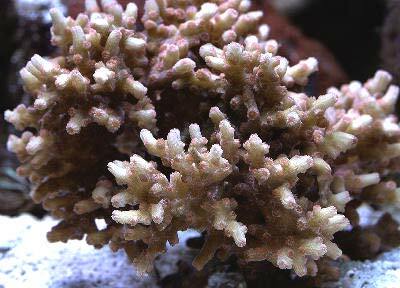 The C. decadia looks similar in appearance to certain Acropora corals as their polyps are on the end of a branch. These corallites, though small, are very attractive. Being so small they often have a 'fuzzy' appearance, but with close inspection you can see that they are actually star-like. This is because they have 10 to 12 tiny ridges on the outside wall of the corallite, known as costae, which gives them this starry appearance. Also because of their small size, they will sometimes be called a small polyp stony (SPS) coral rather than a large polyp stony (LPS) coral like the majority of the corals in the Faviidae family. The Lesser Knob Coral is a fairly hardy coral. The Cyphastrea genus in general is moderate to easy in care and will do well in normal reef conditions. They like a moderate water movement with moderate to low lighting. Like other members of the Faviidae family, the polyps come out at night. They can be fed small foods like rotifers, newly hatched brine shrimp, mysis, zooplankton type foods, and other foods for filter feeders. C. decadia is said to prefer lower lighting, and If your lighting is lower they should be fed more often. Meteor Shower Coral, Cyphastrea sp. and Astreopora sp. The difference of the Cyphastrea in the video and the Lesser Knob Coral that is featured, is that the Lesser Knob is a rare branching form that is often confused for an SPS! That coral can start out rounded but will eventually form branches as it grows. Once again, that calm voice gives us a wonderful education on these corals. Moderate water flow and low light is needed for both of these genus. Branching or not, the same care is needed and too much light will turn your coral brown. Distribution / Background Cyphastrea Coral Information: The Cyphastrea genus was described by Milne-Edwards and Haime in 1848. There are approximately 26 nominal species, about 8 of which are valid species including: C. agassizi, C. chalcidicum, C. decadia, C. hexasepta, C. japonica, C. microphthalma, C. ocellina, and C. serailia. Some common names these corals are know for are Mound Coral and Lesser Knob Coral. The Cyphastrea genus has been propagated in captivity and some unique names from propagators are Meteor Shower Cyphastrea and Blood Red Eyes Cyphastrea. The Lesser Knob Coral Cyphastrea decadia was described by Moll & Best in 1984. Aquacultured specimens have been developed with some very gorgeous colors. Some of the unique specimens can have deep purple, green, or pink bases with red, dark red, or pink polyps. Some names they are found under are Pink Panther, Pink Star, Firecracker, Orange / Red Decadia, and Tyree's Cyphastrea decadia. Where Cyphastrea Corals Are Found: The Cyphastrea genus are found in the Indo-Pacific, the Red Sea, Marshall Islands, Samoa, Tahiti, Japan to Java and Indonesia, Australia, and the Philippines. Cyphastrea Coral Habitat: The Cyphastrea genus are found on pretty much all reef habitats from the sub-tropics to the tropics, at depths from 10 - 131 feet (3 - 40 m). The common imports are mostly from shallow reef environments. Description What do Cyphastrea Corals look like: The Cyphastrea genus form massive colonies that are large and encrusting, with just a few species like Lesser Knob Coral C. decadia, that form tree like branches. The corallites all have separate walls within the colony (the corallites are the raised areas in which polyps reside). Their very centers, or calices, are less than 3 mm in diameter, making them easier to identify. The tissue in between the corallites has a grainy surface, and like other Faviidae, the polyps come out at night. Their colors include gray, brown, cream, green, yellow, and white, with aquacultured varieties can include other colors like dark red, red, pink, blue, and shades of lavender. To tell the difference between the species, you need to look at their skeletal structure. C. decadia is the most unique of this genus, forming branches that would almost make you think you were looking at an Acropora from a distance. Once you get closer, it is obvious which coral you are looking at. On the branches, that can "Y" out, all of the corallites are raised. They are longer or more tubular than the other species. It has 12 costae and 12 septal teeth. The teeth are even in size, but the corallites themselves can alter in height. Author J.E.N Verons has identified this coral as C. decadia in his more recent book, "Corals of the World", while in his earlier book "Corals of Australia and the Indo-Pacific", it was identified as C. japonica. C. serailia is the most commonly seen species in the aquarium trade. The outside edges of the corallite (raised area where the polyp resides) have teeth called costae. the costae alternate from large to small height wise, but are pretty even going around each corallite (at the base of the corallite). It is relatively smooth looking when the polyp is in a normal expanded state. The teeth on the inside edges of the corallite, where the polyp is, are called septa of which this coral has 12. C. chalcidicum are not as common as C. serailia. The outside edges of the corallite (raised area where the polyp resides) have teeth called costae that alternate from large to small. At the base of the corallite, the larger costae stick out considerably more than the smaller ones, giving it a rough appearance. The teeth on the inside edges of the corallite, where the polyp is, are called septa of which this coral has 12. C. microphthalma are also not as common as C. serailia. The outside edges of the corallite (raised area where the polyp resides) have teeth called costae. This species has 10 evenly sized teeth that are prominent and have less flesh between them than C. serailia, but more than C. chalcidicum. The teeth on the inside edges of the corallite, where the polyp is, are called septa of which this coral has 10. Difficulty of Care Cyphastrea Coral Care: The Cyphastrea genus in general is moderate to easy in care and will do well in normal reef conditions. The Lesser Knob Coral is a fairly hardy coral. They like a moderate water movement with moderate to low lighting. Like other members of the Faviidae family, the polyps tentacles come out at night to feed. Foods / Feeding Cyphastrea Coral Feeding: The Cyphastrea genus, like other stony corals, have developed several feeding strategies. Through a symbiotic relationship with a marine algae, known as zooxanthellae, they receive the majority of their nutrients. They also capture planktonic organisms, food particles from the water column, and can absorb dissolved organic matter. In captivity, the Lesser Knob Coral needs to be fed at night when their tentacles are out. Feed rotifers, newly hatched brine shrimp, mysis, and zooplankton type foods, including foods for filter feeders. They do need to be fed at the very least, once a week, and grow quite well with regular feedings. C. decadia is said to prefer lower lighting, and if your lighting is lower, like other Flaviidae, they should be fed more often. Aquarium Care Typical water changes of 20% a month, 10% biweekly, or 5% weekly are needed. It has been noted that 5% weekly water changes replenish many of the needed additives and it is ultimately cheaper than purchasing additives for the water. With higher concentrations of coral with calcareous skeletons though, there may be a need put in additional additives to maintain proper levels for good growth. They secrete mucus, so along with a good water flow, carbon may be used. Aquarium Parameters A well-feed live rock/reef environment is what is needed for your Lesser Knob Coral, along with some fish for organic matter production. A mature tank is recommended. Be sure to have proper water movement and provide sufficient lighting. It needs moderate to low light, but will usually will be able to adapt to higher lighting conditions. Higher lighting may bring out its color better, while it may extend more under lower light. It may be kept under normal output fluorescents, to more intense light sources including metal halides. Provide moderate water movement for the best health. This is a peaceful species, but it does need distance between it and other corals. Marine Lighting: Moderate to low, will usually adapt to higher lighting. Compatibility and Social Behaviors The Cyphastrea genus is peaceful with other genera.They do need distance between themselves and other corals due to their peaceful nature. They do have tentacles that come out at night, but will not win wars, so place accordingly. Breeding and Reproduction The stony corals are hermaphrodites, male and female within the same organism, and can reproduce both sexually and asexually. In the wild they reproduce sexually by releasing eggs and sperm at the same time, resulting in a fertilized egg which then forms into a free-swimming planula larva. Eventually the planula larvae settles onto the substrate, becoming plankters. This then forms a tiny polyp which begins to excrete calcium carbonate and develops into a coral. Planula larvae are extremely vulnerable to predation, and very few survive. The Cyphastrea genus are hermaphrodites that fertilize externally through mass spawning events, and this genus reproduce asexually as well. In captivity, the Cyphastrea genus can propagate by fragmenting, by extratentacular budding (budding on the outside edges and sides of the colony), or intratentacular budding (when a polyp divides into 2 polyps). They will also use polyp bailout and polyp balls to reproduce. Propagation should be similar to other Faviidae. Start with a fully acclimated specimen. Using a dremel or similarly powerful tool, cut at least least a 1" size frag. Cut this from the edges if possible, since the bone is less dense there. Glue the frag to a plug or rock. You can use the 2-part epoxy or underwater putties. Make sure the frag has good water flow to help it heal. Potential Problems The Cyphastrea genus are generally hardy as long as they are kept in good conditions. Specific ailments are unknown. Availability Cyphastrea Corals for Sale: The Cyphastrea genus is very easy to find at pet shops and on line. Online they can run about $20.00 to $45.00 USD, or more depending on size and/or color. Often corals that are for sale from this genus are just identified as "Cyphastrea sp. ".